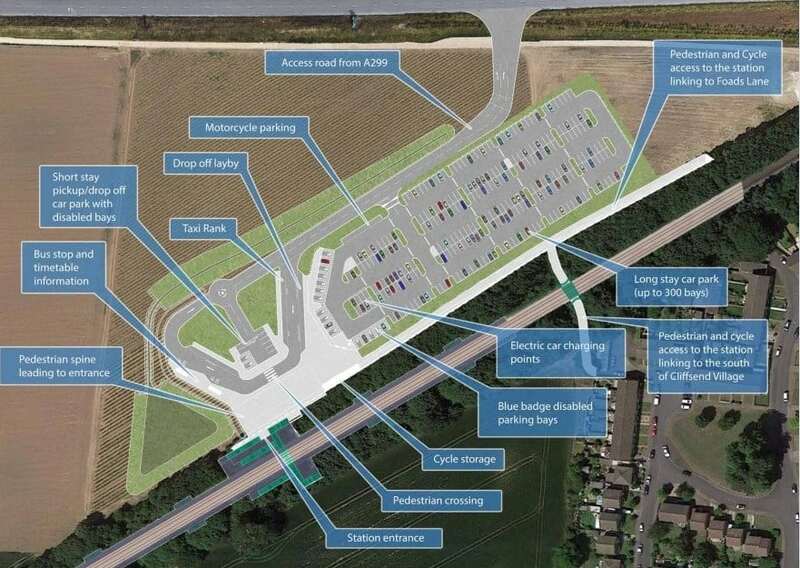 Thanet council will foot £2 million of the bill for the proposed parkway station at Cliffsend. The funding was agreed by council Cabinet members on Tuesday (January 15) as part of the proposed budget for 2019-20 and financial plan for 2019-2023. It is expected to be approved at full council on February 7. The sum was confirmed during the meeting after Labour’s Peter Campbell questioned the contribution. Council leader, Conservative Bob Bayford, said: “There are anticipated costs (to Kent County Council) of £26 million and they are still looking for contributions. The aim is to provide improved services to London Stratford International station. However a statement from the Department for Transport, in response to a Freedom of Information request by former councillor Ian Driver,said the proposal would shave just one minute off of journey times from Ramsgate and Margate. 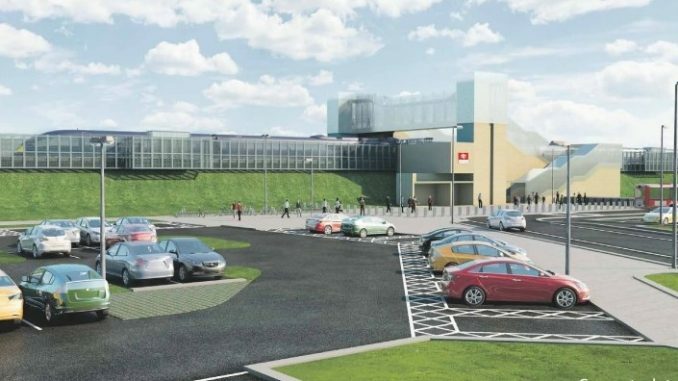 The original estimated cost of the project was £11.2 million but in 2016 documents from a SE England Local Enterprise Partnership (SELEP) and Kent & Medway Economic Partnership (KMEP) meeting said the cost could rise to £26 million. KCC rebutted this saying construction costs were expected to be £16 million and the revised total was £21.4million. A government grant of £10 million was agreed through the Regional Growth Scheme but this still leaves a significant shortfall. KCC say other options are being explored to fill the funding gap. A spokesman said: “KCC are contributing £2.65 million from our own capital, and the South East Local Enterprise Partnership are contributing £10 million from the Local Growth Fund. “The lower cost estimate was from an early stage in the project and the revised figure of £21.4million is based on the GRIP (Guide to Rail Investment Process) 3 design, which is a feasibility design. The DfT previously rejected KCC’s £8.7m grant application towards the cost of building the station. The station is due to open in 2021. A £26 million station in the middle of nowhere with our hard-up council making cuts everywhere now finding a spare £2 million to waste on it and millions more to waste on doing up the council offices and to alter the port of Ramsgate to allow bigger Brett aggregates ships in is just incredible. We are paying for this complete waste of money and these fools in office. Totally agree with you, all for the sake of a minute! Then add all the additional car movements to it because of the remote location and sparse public transport options! 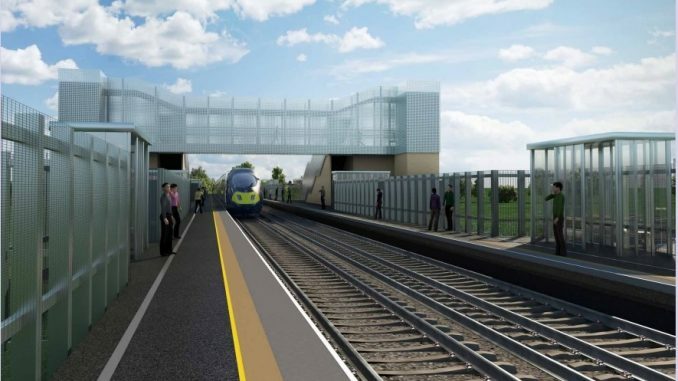 So, first KCC and now TDC are the only people who think the new Parkway Station is a good idea! The residents of Cliffsend don’t want it. The Government doesn’t want it. And, as ex-councillor Ian Driver correctly states, it only shaves 1 minute off the time to London. And by the way, Ebbsfleet isn’t what most Thanet residents would call London! Ramsgate has the choice of either a slow or a fast connection to St. Pancras. Improve that facility instead. Itt has a fabulous frontage and with some TLC, could be made into a wonderful station and café. TDC are always pleading poverty, but in the past 2 days have committed £3 Million to improve their working conditions and now have miraculously found another £2Million to pay for a new station that nobody else (apart from KCC) wants! Another lousy and expensive business move by TDC! Hang on! What’s all this about London government grants, KCC grants and even £2 million from Thanet Council. Haven’t we been told by the Tories for years that state assistance is a BAD thing and that “free market forces” will decide if something gets done? But it looks like we-the taxpayers-will be forking out the cash to help out yet another Private developer who will scoop their “bonuses” and juicy salaries and pensions off the top, looking at what’s left and then announcing there isn’t enough so that the weak and feeble Tory government and councillors will just dig deeper into public money to hand over even more. I don’t object to the station as all the London commuters who will be living in the houses on the former airport at Manston will need a convenient station for their daily journeys. But I wish that the Conservative Party would be honest with us and admit that NO major infrastructure or industrial project in this country will even get past the Planning stage without oodles of public money. Because the private companies involved won’t risk their own cash. But they have no problem wasting public money, courtesy of their “captured” politicians, the Conservatives. If no houses are built on Manston Airport, Parkway definitely won’t be needed and the way the DCO is going so far, it will reopen as an airport. Funnily enough, that’s what it is! It has only been closed for 4 years out of 100+ and is set to get half a Billion £££ invested in it. There is no airport at Manston. There is a brownfield site whose legal owners have plans for housing and workplaces. PINS has published a long list of questions which RSP must answer. It looks as if RSP will have to stop being so cagey about their alleged investors. Manston wasn’t a commercial airport for 100 years. It was a military airfield. It was a commercial airport for 15 years; it lost £100,000,000 in that time. The DCO process has reached the Examination Stage, and Boy! the Examining Authority is certainly doing it’s job. They’ve just published a list 178 pages long containing nearly 500 questions for RiverOak. Questions such as “who are the investors”, “where’s the Business Plan”, “DfT says dedicated cargo is declining, you say it’s not – explain your conclusion” and so on and on. The way the DCO is going so far, it won’t reopen as an airport. I find it unfathomable that people are not aware that if the houses are not built on Manston they will be built elsewhere in Thanet on greenfield land. Are you not aware of this Thanetian Resident? That’s good that will come in handy When Manston Airport reopens. 1) It is most unlikely that Manston will reopen as an airport. 2) If it did, it would be cargo. So Parkway would be pointless. 3) In the doubly unlikely event that Manston opened and provided passenger services, then some sort of shuttle bus service would be required to get passengers from the airport to the station. And that station might ad well be Ramsgate, as it’s already here with its 4 platforms. Again, Parkway pointless. Quote amazing. KCC own figures used Deal to illustrate the time that would be saved between Thanet and London. I had to tell KCC to look at a map! Deal isn’t in Thanet. Oh, and of course, Adult Social Care is the responsibility of KCC who have just removed the subsidy from a vital route. A precursor to building a huge housing estate for the DFLs??? The idea of a new station so close to Ramsgate and Minster is absurd. As Thanetian resident sais, spend the money on improving the existing local railway stations. Cuts and more cuts, locally- yet TDC has £2.m for this? What’s the betting that all these companies getting hand outs by TDC are all owned by Tory voting owners ! 3 million to repaint the offices now 2 million to give to a private company to build a railway station. You couldn’t make it up ! This station will NOT reduce travel time between Thanet and London. Imposing another stop will ADD to the journey time. What would improve journey times would be to upgrade the track and signalling between Ramsgate and Ashford. The proposed Parkway Station would be no use to anything at Manston, whether it was air passengers or residents. A shuttle bus would be needed, which could just as well go to Ramsgate. It beggars belief that TDC should squander £2,000,000 on a useless station. And how on Earth can £3,000,000 be justified on starting up Cecil Towers? We’re in the midst of a period of austerity. Rough sleepers abound in our towns. Food bank usage has shot through the roof. If we’ve got £5M spare, then use it where it’s needed. This is a poorly engineered design of a station that is of dubious value. It is not only obscenely expensive, it will also negatively impact the main dual carriageway from Ramsgate to London. There aren’t a pair of brain cells in the collective KCC and TDC councils to look after the interest of the people of Thanet. Complete waste of taxpayers money which they are stealing from things that are of real value and will generate long term growth for the isle. Simply an outrageous waste of money. Do the basics TDC, street cleaning and efficient rubbish removal would be a start. I’m all for spending money improving infrastructure such as the railways however this project has never made sense. Adding a station stop to a service will always slow it down, adding a couple of minutes to the journey. The only way we could say the parkway station reduces travel time would be to say that it replaces Ramsgate station so you are starting your journey closer to London anyway. To speed up the service a lot of work in the Grove Ferry area would need to be done to increase the speed of the trains. The High Speed service would be more accessible if it also stopped at Minster. It would be cheaper to add additional parking to this existing station and undertake some road improvements that probably need doing anyway. So my question is how is the Parkway Station of any benefit? Personally I can’t answer this question, I can only assume that we have councillors living in Cliffsend that want a fast convenient way to get to London? Duurh! This Tory council couldn’t run a bath! 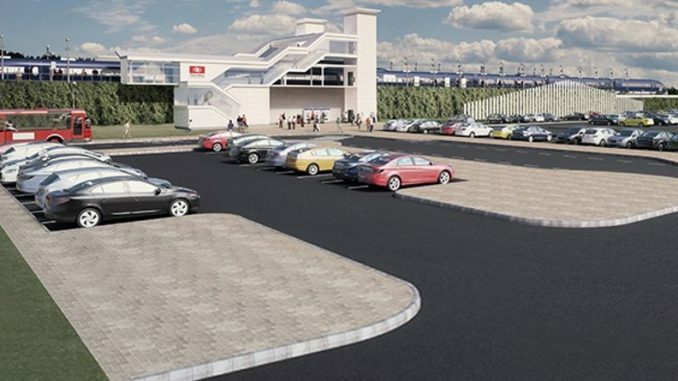 Whats wrong with making the existing Minster station car park bigger, there is plenty of room nearby? Once again the council are spending money on a white elephant, and getting their priorities wrong! Thanet is desperate for social housing, not some half thought out unnecessary railway station, that no one will use! Again, Duuurh! If the proposed Parkway Station replaced Ramsgate Station it’d increase journey times for a lot of people, especially those who don’t have a car. This proposal comes out worse every time it raises its pointless head. I just do not understand why this useless project still drives on relentlessly. Why is it no one at TDC or KCC ever listens. Can they find a single voter who thinks this is a good idea. I can only surmise that the TDC Cabinet does not want to be elected. After all the TDC cabinet are proposing £3m for a refurb of Cecil Street,£2m for a larger berth for Bretts and now a contribution to Thanet’s own ground nut scheme, Thanet Parkway, while bleating that they have a £1.8m deficit on revenue expenditure, its inexplicable. They are giving the opposition several big sticks to hit them with. I cannot understand why they would do that unless they believe voters are as credulous as themselves. While there are many valid arguments for and against these expenditures, the conflating of capital and revenue to bash the council with misses the point entirely. Agreed, but capital expenditure today is an increased revenue deficit for decades to come as none of these schemes are revenue generating for TDC. Let’s all make sure we contact our TDC councillors and tell them. Then they can’t claim that they didn’t know the strength of public opinion. Even if there was another airport at Manston, run successfully this time, it would be a cargo airport. If PINS has any sense they’ll refuse RSP’s application. Freight can’t be loaded onto trains because 1) there is no airport and 2) the nearest rail line is a couple of k away. Expert after expert have made the same point: Manston is too far away from everywhere else, and even if spending on transport infrastructure to the tune of a large fraction of HS2 were carried out, it’s still unlikely that Manston would do more than break even. As for houses: the government says we need lots. It makes sense: the population is going up. People need somewhere to live. “We” (ie Britain) do want social housing, and plenty of it. How can housing ever be pointless? If Brexit happens, Britain will not be less dependent. It will be very dependent on countries such as China, Russia, America and Saudi Arabia. The view propounded by Bruce seems like Thatcherism at its worst. Even worse than the current government. Why do you want this country and its social, political and economic culture to be weak Marva Rees? Why do you not want people to be enabled and empowered? What is so attractive about dependency and lack of self-reliance Marva Rees? Bruce is jumping to some strange conclusions in his 10.07 posting here! As he is wrong in all his assumptions I feel no need to answer his questions. Who said anything about roads? It was you who mentioned loading cargo onto trains, I think. And the arguments aren’t mine, fatuous or not. They are the opinions of a number of experts in aviation. Do you have an expert opinion (other than yours) which says that Manston is well placed ad a cargo hub? If so, please quote it. The housing need, according to Thanet’s Draft Local Plan, based on OAN data, is about 17,000 homes. Do you know different? Can you quote an authoritative source? Not housing ‘associations’ …just housing. We certainly do not want more need of ‘housing association’ – as we want the population of Thanet gainfully and prosperously employed! I lived in housing co-operatives for over thirty years and there was as wide a variety of people in them as there is any average urban street- including well-educated and poorly-educated people, nice and not so nice,employed and unemployed. The hostility towards a) Londoners and b) social housing tenants which is shown by some contributors astonishes and depresses me. But given the ways in which successive Tory governments try to set people against each other, I suppose I shouldn’t be so surprised. Is that the sort of “disclaimer warning the reader not to base any business decisions upon it – An admission of its worthlessness” you had in mind? Further: the Azimuth Report was based largely on other work done by York Aviation for the Freight Transport Association and the DfT. Subsequently, at a meeting hosted by KCC, MS Louise Congdon of York Aaviation pointed out how Azimuth had misquoted and failed to understand the material they had used. And since you’ve made such a study of the (worthless, using your yardstick) Azimuth Report, please will you give us the benefit of your opinion: is it 17,000 ATMs, or 83,000 ATMs? Both figures are quoted. I don’t want an airport at all and I’d rather see housing on a brownfield site than on greenfield sites. “Depth of corruption” is perhaps something we should all be told about, if it exists. I find your arguments really interesting, on all sides! However I do object to TDC allocating 2 million to the station project. When I do not have cash and need to make savings I don’t allocate large amounts to other people’s projects. Parkway useless.. Not going to attract more people to the area that already.. they should spend money on our awful roads that ruin our cars.